Though, in modern times, the glove does not carry as much symbolism. They are, nonetheless, still used to protect our hands. They also give the wearer dexterity as well as warmth. 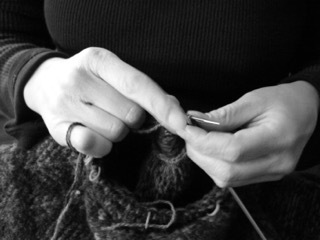 Gloves are made in a variety of materials, but for a knitter, there is only one material to use and that is wool. It will keep your hands toasty warm as well as wicking away the moisture. Even when wool is wet, it retains its heat properties. Gloves are fun, give them a try, I think you will enjoy them. We are offering a class in February for fingerless gloves; in this way you can make gloves without knitting the whole finger. Great for keeping your hands warm when knitting or any other activity where you need to keep your hands warm but need to use your fingers. They also make wonderful gifts. Show your love and appreciation for someone special; knit them a pair of gloves or fingerless gloves. They will think of you every time they wear them.